This year’s children’s service is based on Paul Gerhardt‘s Christmas hymn, "O Jesus Christ, Your Manger Is." It’s not the most common Christmas hymn. It’s probably not on everyone’s favorites list. But in my opinion there are few that are better. As I was doing a little research I happened upon an article about Paul Gerhardt’s hymns from the Forward in Christ a few years ago. The article is written by Prof. Theodore Hartwig. I thought I’d share a portion of it with you. Many of Gerhardt’s 17 hymns in Christian Worship are much admired and much used. It would be a credit to our worship practice if another of his hymns, much neglected, won its deserved place in the sun. It is the Christmas chorale “O Jesus Christ, Your Manger Is” (CW 40). On reading this hymn no one can fail to notice its childlike quality and its focus on the central truth of Christmas: God coming into human flesh. 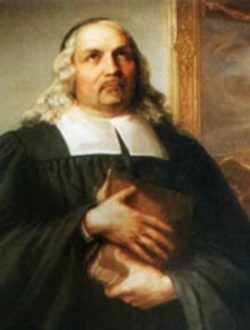 The excellence of the text is matched by a tune of calm, confident serenity that was composed by Gerhardt’s friend, Johann Cruger. The second stanza tells how the eternal God condescended to our low estate. The third stanza sings of the comfort gained from Christ’s birth. The fourth raises this comfort to the higher bliss reserved in heaven. The final stanza bids each believer to turn away from this world’s distractions and keep heart and mind fixed on Jesus. It’s a matchless meditation: "The world may hold her wealth and gold; But you, my heart, keep Christ as your true treasure. To him hold fast until at last A crown is yours and honor in full measure." We should be grateful that the world has not added this hymn to the roster of carols blared from loudspeakers at scores of shopping centers. When the world touches holy things, it unfailingly cheapens them. Praise God that we possess this hymn exclusively as our own. I might note here that this year is the 400th anniversary of Paul Gerhardt’s birth. There have been a number of celebrations and commemorations throughout the Lutheran church over the past year to remember and give thanks for such beautiful hymns.